Leicester City defenders Wes Morgan and Danny Simpson joined more than 100 young people from several schools throughout Leicestershire to take part in safe and positive discussions about how to challenge racism within society. The young people took part in an anti-racism educational workshop where they explored the ways in which stereotypes and assumptions can lead to the development of prejudicial attitudes and talked about ways that they can help tackle racism safely. The workshop looked at the external influences which can help shape a young person’s world view and encourage the young people to question the information they receive and to think critically about where ideas come from. The school pupils were then treated to a screening of the Show Racism the Red Card anti-racism education film; which features players from across the world making a stand against racism and shares the personal experiences of young people who have experienced prejudice. Following the film, club captain Morgan and full-back Simpson arrived to field questions from the young people about their own experiences of racism, both within sport and in wider society, and about the type of advice they had for anyone who experiences racism or intolerance. Wes Morgan paid tribute to the work of Show Racism the Red Card and described how abuse that he had faced on the pitch pushed him to try even harder. 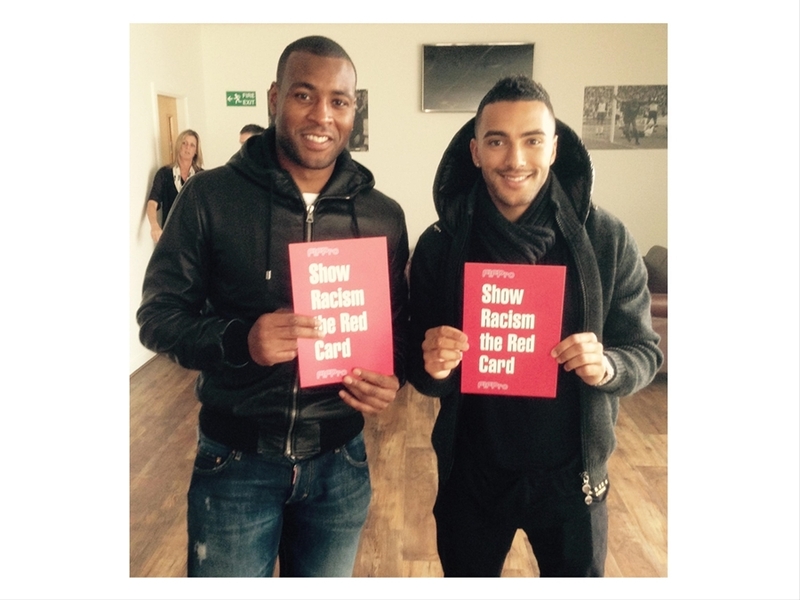 Danny Simpson, who has now taken part in a number of SRtRC events, described a different experience; explaining that he feels so strongly about racism that any abuse targeted at him would be likely to put him off his game. He also encouraged the young people present to report any examples of racism to an adult. A video of the event including interviews with Wes Morgan and Danny Simpson can be viewed via The Official Leicester City FC website. Prizes were awarded for the most insightful and unique questions and the pair of Premier league stars also signed autographs and official Leicester City SRtRC posters for the young people. SRtRC would like to thank all those at Leicester City for their continued support for the campaign, with special thanks going to Wes Morgan and Danny Simpson for giving of their time so generously.